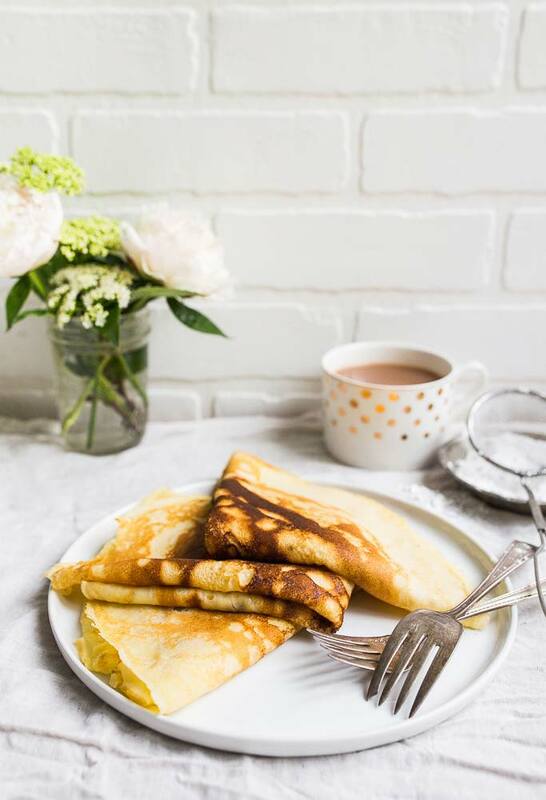 Crepes for two are such a perfect breakfast or dessert for two that is easy and simple to make! This isn’t particularly flattering about me, but I have to confess: I used to live near a crêperie and never ordered crêpes! I lived near Crepeville for almost a decade, went there often during farmer’s market breakfast dates (yes, those are a thing in California), but I always ordered bagels. But let me defend myself: the bagel came smeared (schmeared?) thick with cream cheese, a pile of artichoke hearts, and niçoise olives. It was a salty breakfast lover’s dream, which is me–I like salt in the morning, not sweet. I save all of my sweet cravings for dessert after dinner. There’s no world where I would turn down food with both olives and artichokes. So, I happily ordered my salty bagel, my friends and boyfriend du jour ordered crêpes, and life was good. Yes, I eyed my friends’ crepes, especially when Nutella was involved, but I resisted, nonetheless. I vaguely remember an early date with my then-boyfriend-now-husband (in which he told me was dating someone, and I sat there silently in my head saying OMG THEN WHY ARE WE HERE? WHAT ARE WE DOING? IS THIS A FRIENDSHIP? WHY ARE YOU SO GOOD LOOKING? ), and he ordered crêpes. He offered me a bite (I think it was a strawberry and chocolate crepe), and I can’t remember if I said yes. I ordered myself a pretty crêpe pan in one of my Francophile fits (every 6 weeks or so), and have been wanting to make crepes for two. I thought they would be hard, but they were so easy. Everything comes together in the blender. Don’t miss the how-to video at the top of this post that goes over exactly how to make crepes for two. 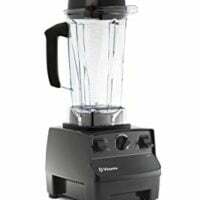 Here’s the blender I use. I thought they would be dry and need a cream sauce on top, but they don’t. Crêpes are just simply perfect AS-IS. I had lots of misconceptions about crepes, but they were all wrong: they’re not bread-y or egg-y. They just are light, fluffy and creamy at the same time. 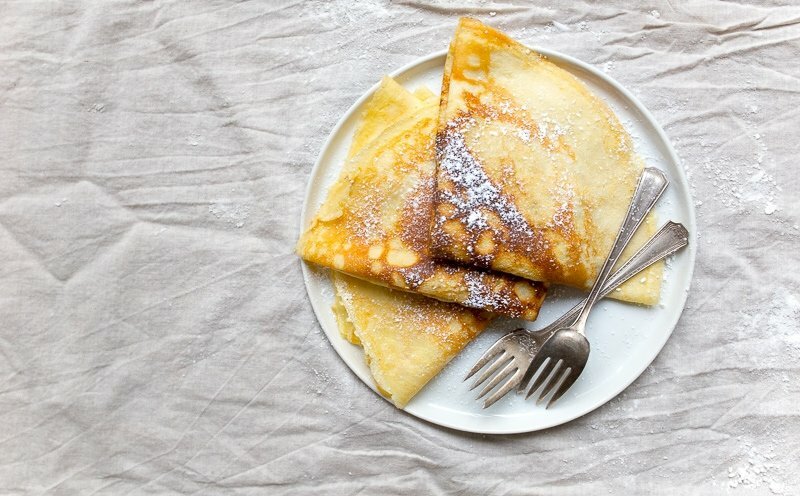 They’re crêpes for two, and you’ve got to make them for yourself! It’s hard to describe, but if I had to, I’d say cooked custard. Creamy in your mouth, even though they appear dry like bread. In a way, crepes are magical like that. And as someone who is overly sensitive to egg-y flavors, I can assure you: these have absolutely none. The best way to make crepes also happens to be the easiest way: completely in the blender! It feels counterintuitive to make batters in the blender because we’re often told not to mix flour too much, lest the gluten develop. But when it comes to crepes, they contain such a small amount of flour, that’s we’re fine! We’re basically just making a custard in the blender that we’re cooking in small sheets. You can take these in a savory direction, or you can go sweet. When I make these savory crepes, I roll them up with diced ham and grated Gruyere cheese. I served them to my parents this way for the first time, and they flipped for them! For the savory version, decrease the sugar from 1 tablespoon to 1 teaspoon, and double the amount of salt to 1/4 teaspoon. The reason we’re not omitting all of the sugar is because it helps with the browning process in the pan! The brown bubbles that form as the crepes cook are largely a result of the sugars caramelizing and cooking. I make these sweet crepes most often by rolling them up with fruit and chocolate or caramel sauce. A high-quality delicious homemade jam is great spread on a crepe, too! However, you can stack them up in many layers to form a cake! Stuff caramel and whipped cream between each crepe layer, and you’ll end up with a beautiful, delicious layered dessert! This just might be my birthday cake of choice this year! The recipe makes just 3 large crepes for two, because my site is for small-batch recipes. You might have already known that, but I just want to point it out before you continue. It’s the perfect amount for romantic breakfast in bed, or for a quick dessert for two after dinner. I haven’t tried doubling the recipe myself, but if you do and it works, please let us all know in the comment section below. I would love to hear from you! And while the old adage goes that the first crêpe is for the trash can, you obviously don’t want to do that because then you would only have 2 crêpes left. (Woe, the small batch lifestyle). To make sure that first crêpe isn’t a total waste, let the pan really pre-heat (longer than you normally would, give it plenty of butter, and don’t be in a rush to flip it. It will release itself from the pan when it’s cooked. It will if you believe! Also, watch the how-to video to get an idea of what the butter should sound like in the pan before it’s time to add the batter and start cooking. 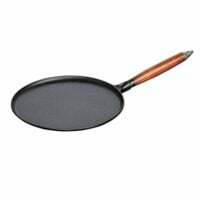 Oh, and THIS is the exact crepe pan I use. 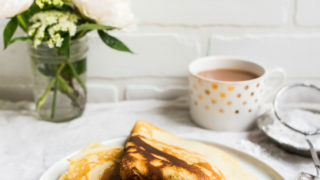 I also have a recipe for Dulce de Leche crepes here on my site, but it’s a totally different method. That recipe comes from someone’s cookbook, and is for Swedish style crepes. My recipe here is for French crepes, also known as the best crepes. Crepe recipe for two. Crepes for two! In a blender, add the milk, egg, sugar, flour, salt, and 2 teaspoons of the melted butter. (Reserve the rest of the butter for greasing the crepe pan). Puree the mixture for about 30 seconds on high, and then turn off the blender and let it rest for about 5 minutes. Meanwhile, place your crepe pan over medium heat, and brush with some of the melted butter. Ladle 1/2 cup of the batter into the crepe pan, and then tilt the pan until the surface is covered with the batter. Cook the crepe on the first side until it easily releases when you run a spatula around all of the edges. Loosen the entire crepe with the spatula before attempting to flip. Flip the crepe, and use the spatula to smooth it out (in case it wrinkled when you flipped). Continue to cook on the second side until golden brown spots form. 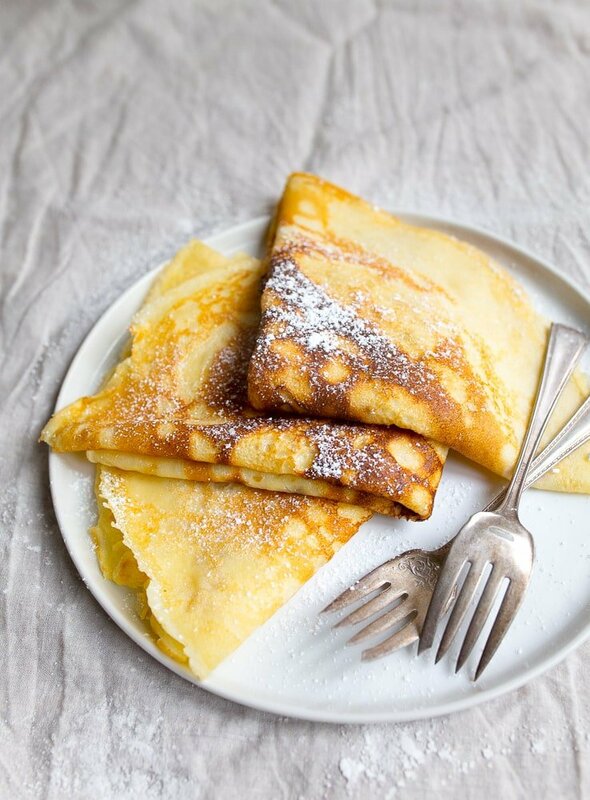 Remove the crepe from the pan and place it on a paper towel-lined plate. Cook the rest of the batter (you should get 2 more crepes from the batter). Serve the crepes with your favorite fillings (sweet or savory! ), or place them (with paper towels in between) into a storage bag and freeze them until needed. This is a recipe in my series of small-batch bread for two. These look marvelous. I would have ordered the bagel as well…umm hello, artichokes AND olives?? I die. Also, I think farmers market breakfast dates should be a thing everywhere. While I feel I’ve truly mastered the Scotch pancake and the big American style pancakes, crepes are still not my best friend. Typically, my boyfriend loves crepes and loathes thick pancakes (woe is me) so I’m gonna have to learn some time. This recipe has encouraged me to do just that, so thank you! Also I must say, I probably would have ordered that amazing bagel AND a Nutella crepe. No shame. I think I want to take you on a date where we eat all the carbz! Saw how easy this recipe looked and i couldn’t resist!! Added some vanilla extract as well to the batter, and this made about 5 crepes in a smaller pan. Had it with some strawberry jam and Nutella. Oh my god, it was divine! Yay! I’m so glad to know a small pan makes 5 crepes. Yum!! I feel like we are always on the same wavelength. I’ve been craving crepes like crazy lately, but am always distracted by all the other carbs available to remember the humble crepe. My mom used to serve them with powdered sugar and lemon juice when I was little, but I haven’t had one since- your recipe looks perfect! I have to try them this weekend!! Love the for two recipes thank you. Hi. I made the crepes and they were great (got five too). Just wanted to share a tip I learned from a chef… that you don’t have to flip the crepe and cook the other side, just flip it out when browned on the bottom (the top will look moist but is dry) and start your next one, they don’t stick together as you stack them and this chef also used butter flavored spray, which I did too. Then you just fill the “uncooked side”. So simple. Hope you try it next time and thanks for the recipe. What a cool tip, thanks! These crepes were really good! But they didn’t stay together. In the past I had great crepe recipes that stayed together!! A little bit of butter and sugar to put on top of the crepe tasted fabulous! Oh no, Ari! You mean after they cooked? Did you stack them between paper towels to blot off excess moisture? THREE (3) crepes for TWO people….. how does that work? Each person gets 1 1/2 crepe??????? Can’t wrap my brain around this. BTW – Your Cinnamon Rolls were AWESOME!! If you take care and don’t ruin the first crepe, you get 4. But I’m also okay sharing a crepe with my husband. Made these but they were a little too sweet for toppings, but well sweetened if eating alone. It was good to have small batch proportions, but I’ll likely be adjusting by halving the sugar, doubling the salt and cutting it the oil/butter in the car entirely. Best crepe recipe (even though I accidentally put two tablespoons of butter into the batter). Added vanilla like someone else suggested. Perfect breakfast for me and my toddler! What do you think the calories are in just 1 crepe? Thank you for this great recipe. Just made these for my boys and they ate it all up. Perfect for picky eaters. I love this recipe because its nice and light. I used a small pan so I got about 10 crepes which is perfect amount for us. Yum! These were pretty awesome! Mine didn’t stick together so well but that’s okay. I didn’t add the sugar because I planned on some being savoury. I made two savoury ones first and then added a pinch of vanilla to the batter for the next two ones that would be sweet. Thanks! I’ve been making these for me and my toddler since you first posted the recipe (yum!) and I just wanted to share our success using a shy 1/2 cup of whole wheat flour instead. Cooked on medium-low heat with a tiny bit more patience, they are still a lovely crepe texture. Thank you! Can we trouble shoot together? The batter is supposed to be runny. Did you follow the instructions? Did you make it in a blender and let it sit? Did you catch the how-to video for this recipe? Worked up the courage to try this recipe this morning. SO. GLAD. I. DID!! It came together quickly, easily, and perfectly. I did flub the first one, but ended up with 5 good crepes anyway. I used a smaller pan, hence, less batter. Filled with lightly sweetened cream cheese and a little cheery pie filling. So stinkin’ good! Thanks so much for sharing this recipe. I took a pic to share with you, but now I can’t see how to upload that. This recipe is amazing! I actually used my immersion blender for easy cleanup. Worked perfectly. I omitted the sugar and vanilla and made savory crepes filled with ham, scrambled egg and shredded cheddar cheese. Amazing! Thanks so much for this super easy small batch recipe! I’ve been looking for a recipe. I lost mine years ago. We just got back from Europe and we’ve been trying to duplicate the crepes we had while there. I’m happy to say this is as close as the one I remember and I love this recipe! I got 4 crepes….could have gotten 5 if I hadn’t made a huge first crepe. Spread on some Nutella and sprinkled some powdered sugar. Delicious!! Even my daughter said this was the best recipe since we’ve been on the hunt! This small batch recipe saved my pregnant self from shoving 12 crepes down lol. Thank you! This recipe is amazing! Got 8 by using a 60ml measuring cup in a regular frying pan.